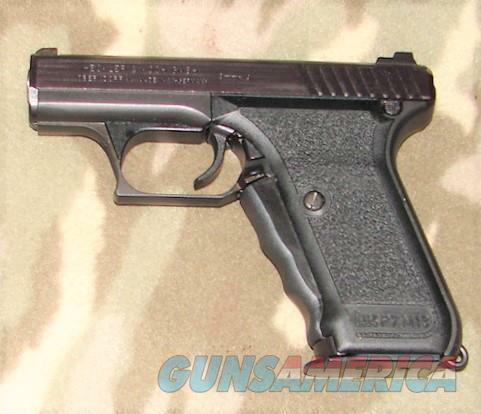 Description: Heckler & Koch P7 M13 Semi-Auto Pistol serial #17-90452, 9mm, 4 1/8" polygonal rifled barrel with a bright, excellent bore. The metal surfaces retain about 99% original phosphate blue with only a few very light handling marks present. The black composite stippled grip rates excellent as well. Pistol features the fixed three-dot sights, and has an ambidextrous grip safety and lanyard loop at the base of the grip. Included are the original box, two 13 round magazines and a cleaning tool. A near new condition example of these quality West German made pistols.